An orange museum? One day I visited the Musee de l’Orangerie, and when Yiannis said, “The Orange Museum?” I realized I had no idea why the museum was called that. Did it have to do with the Principality of Orange in the south of France? Was it once swathed in orange like some kind of Christo and Jean-Claude exhibit? Neither as it turns out. The name comes from the orangeries that used to be on the grounds of the nearby Tuileries Palace and were once considered fashionable to have. The structure was built to shelter the orange trees, and was used for everything from lodging soldiers, to housing sporting and musical events, to displaying exhibitions of animals, plants, and yes, paintings. The building officially became a museum in 1921, and is perhaps most famous for Monet’s Nymphéas, his large panels of water lilies. Who’s Sully? It seemed that everywhere I went in Paris I saw the name Sully, which made me think of Captain “Sully” Sullenberger who, as you probably remember, was integral to the successful crash landing of a US Airways flight in the Hudson River. Needless to say, the Parisian Sully isn’t that Sully. So who was he? The Duke of Sully, otherwise known as Maximilien de Bethune, Henry IV’s “faithful right-hand man” who had a role in “building a strong centralized administrative system in France using coercion and highly effective new administrative techniques.” He also has lots of streets and at least one hotel named after him. What’s a grisette? Where we were staying wasn’t far from the Grisette statute, which we passed every day. But who — or what — is a Grisette? spent more than she earned, but who had an elder male ‘friend’, a shopkeeper or wholesaler who would pay her debts. Her other male friend, a much younger painter or student, was the weekend friend, her passion and the one who would take her to fashionable balls and restaurants. 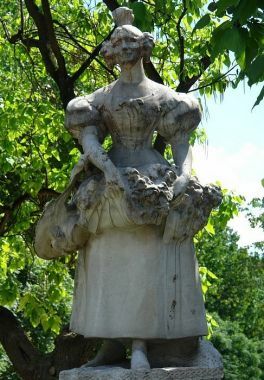 As for the Grisette statue, it was made by sculptor Jean Descomps in 1909, and features one bodacious woman bun. An apple of love? The French seem to have the coolest words for junky carnival foods. First, there was barbe à papa for cotton candy. Then at Disneyland (yes, we went to Disneyland), I noticed caramel apples were called pommes d’amour, or apples of love. It’s obvious where barbe à papa comes from — cotton candy kind of looks like a dad’s long (pink) facial hair — but what do caramel apples have to do with love? Short answer: I don’t know. I couldn’t find anything explaining the connection, although there are a couple of theories as to why pomme d’amour also refers to a tomato. This entry was posted on Saturday, August 29th, 2015 at 5:57 pm	and is filed under language, paris, paris 2015, travel. You can follow any comments to this entry through the RSS 2.0 feed. Both comments and pings are currently closed.